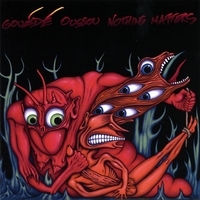 Out of the industrial fires forged by Cabaret Voltaire, Chrome, This Heat, Psychic TV and countless others comes Gouédé Oussou with songs of despair, outrage and pure seething malevolence. The unabashed nihilism of songs like “Jinx Killer,” “Black Wax” and “Deathblow” remind one of throbbing Gristle’s chilling, apocalyptic masterpiece Heathen Earth, though with a decidedly pop edge not unlike Skinny Puppy. Consider the following lyrics: “In the streets I lead the children, smiling and happy to the razor man/Carefully he eases off their faces to add to his range of child masks/In the streets the children dance, for years they’ve been waiting, and now at last/Now they’re happy, for every child has a wet dripping red Halloween mask.” Urban horror and cynical depravity always make psychotic bedfellows in any industrial rock worth the name. Musically, Nothing Matters features pounding, driving drum machines, sinister distorted vocals and a barrage of electronics that rain nuclear fury down upon the listener like radioactive manna from the skies. In addition to the aforementioned tracks, “Human Cuisine,” “Bring Me the Head of Gouédé Oussou” and “Eyeball Mazacca” are particularly aggressive, unnerving and guaranteed to inflict permanent brain damage if listened to on a daily basis. The five additional remixes by various groups (Cheju, Karhide, Terminal Cheesecake, Living Tissue and Puff Tube) give Nothing Matters an almost collaborative feel; all inflict even more sonic damage on the original tracks and consequently on your already bleeding ears. Suffice to say, Nothing Matters is neither for the faint of heart nor for the sleight of brain.